Liam Dunnett with dad Steve and baby Arthur at the Ferry Road lifeboat station. Photo by Tom Colins/RNLI. One of the youngest and potentially newest volunteers at Hartlepool RNLI station was on the crest of a wave when he made a brief and very sleepy appearance to meet its crew. One-month-old Arthur Dunnett, who weighed a healthy 7lbs 10z when born at the University Hospital of North Tees, was taken to the Ferry Road station by proud dad Liam, who along with his dad Steve are volunteer crewmembers for the charity. New dad Liam Dunnett and his own father Steve with Arthur in his arms. Photo by Tom Collins/RNLI. Liam, 27, who has been a volunteer crewmember for a decade and is also a full-time crewmember at Humber lifeboat station said: "This was Arthur’s first trip to the boathouse where he met some of the crew who were busy training at the time. "I don’t think he will remember anything of the visit as he was fast asleep most of the time." Liam and his wife Sally hope that Arthur will also follow in the family tradition of joining the RNLI where Arthur’s grandad Steve has been on the crew for more than 20 years and Liam’s older brother Craig also served for 14 years. 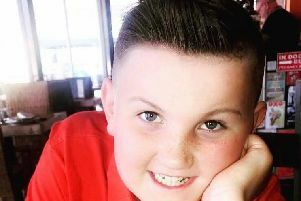 Liam added: "We shall have to wait and see but I hope he does become a volunteer then he can ‘learn the ropes’ from me just as I did with my dad when I first joined all those years ago." Dad Liam was delighted to be able to introduce his baby son to his fellow crewmembers at Hartlepool's RNLI station. Photo by Tom Collins/RNLI. Proud grandad Steve said: "It’s been fantastic seeing our grandson at the station which I hope will be one of many visits in the years to come. "It brings back some wonderful memories of me bringing both Liam and his brother Craig down here as youngsters and showing them around the boathouse and the lifeboats."